Housecleaning without any chemicals will allow you to remove the dirt from the furniture surfaces and take care of your own health. We would like to offer you some tips that will help you to clean the furniture without using any chemical agents. 1. Lemon juice is the best means to deal with the grease stains. Squeeze out a small amount of lemon juice on the stain, wait 45 minutes, then carefully wipe the surface with a wet sponge. 2. Mustard will not only remove the grease and oxide spots, but will also give the surface gloss. 3. Soda may be used not only for dishwashing, but also for washing a stove, tabletops, microwave oven. 4. Have you noticed the dirt stains on the dishware, formed because of coffee or tea? Carefully sprinkle the stains with soda, wipe thoroughly with a wet sponge. Then wash the dishes. 5. To clean the surface of metal and stainless steel, prepare a mixture of half a cup of vinegar and 2 tablespoons of salt. 6. Cleaning the oven becomes a major problem for a housewife. As a preventive measure the oven should be cleaned with a cloth which should be previously moistened with a mixture of water and vinegar. If there is a burned food stain which is really dry, it should be first moistened, then wait till the oven cools down. After this scrape the dirt, wipe the surface of the oven with a wet cloth, dry thoroughly. If the oven got heavily dirty you may use ammonia liquid. Lightly moisten the dirty spots, close the oven door and leave it for the night. In the morning you will easily wipe all the dirt using only a sponge. 7. How to clean the toilet bowl? You may pour the vinegar into the toilet and then put some soda there. These means will be foaming for about 15 minutes. After this you can clean the toilet with a brush, flush at the end. 8. 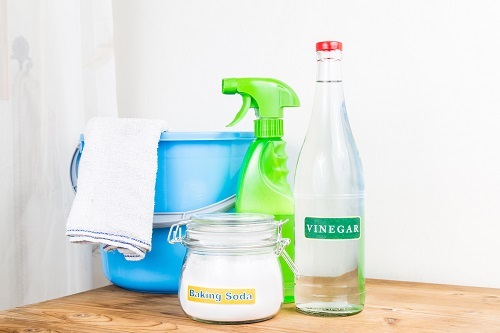 To clean the bathroom, gazed tile, use the solution of vinegar in water. The proportion should be one to two. If there is stubborn dirt, treat it with vinegar and then wipe with a nylon washcloth. 9. To clean a sink you can pour a cup of soda, half a cup of salt and then pour a cup of vinegar. In 20 minutes pour into a sink a liter of boiled water by which all the dirt will be washed away. 10. You may prepare a highly effective agent to polish the furniture: take half a cup of lemon juice, add one teaspoon of olive oil. This solution must be applied to the furniture surface with a cloth. At the end of the procedure carefully treat the surface with a dry cloth.